Her life was torn down to the foundation. Rebuilding will take one small miracle at a time. 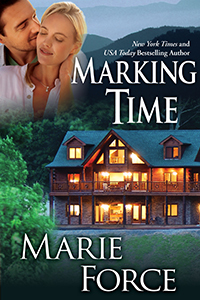 Marking Time continues the story begun in Treading Water as Clare Harrington begins a new life. She’s considered a miracle, but everything that’s happened since she recovered from a three-year coma has been something less than miraculous. Now left to grapple with the aftermath of a selfless decision, she is home from the hospital and trying to figure out what the next chapter in her miraculous recovery has in store for her. Meanwhile, her eighteen-year-old daughter Kate, a talented singer and songwriter, sets out to pursue her musical dreams in Nashville. Her parents have agreed to allow Kate to spend a year there, but they couldn’t have anticipated Kate falling in love with a much older man. Her newly divorced parents are forced back together to confront their wayward daughter. 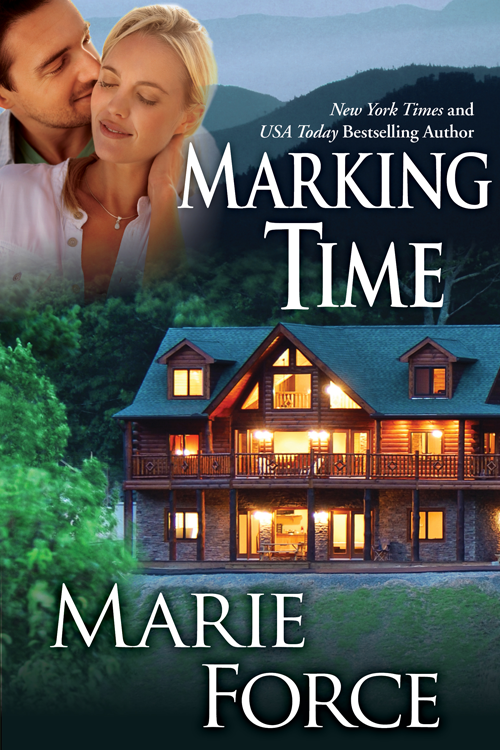 Spanning from Newport, Rhode Island, to Nashville, Tennessee, to Stowe, Vermont, “Marking Time” is the story of new beginnings and new loves. “I don’t know when I have been so engrossed in a novel.”—a recommended read from Joyfully Reviewed. 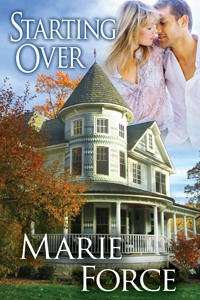 “As with any Marie Force book, you are immediately immersed in this storyline and connect with the characters. Once you start, you are hard pressed to put this down and you’re smiling or holding your breath through all their ups and down. Another excellent read!” – A Reviewer Top Pick at Night Owl Reviews. “Marie Force has worked her magic once again with Marking Time.” – Joyfully Reviewed, A Recommended Read. Clare checked her watch again. One thirty. It must be done by now. My husband—or I should say ex-husband—is remarried. “Ex-husband,” she said with a shudder. Unimaginable. Divorced… Such an ugly word. She wheeled her chair across her room in the rehabilitation center and gazed out at the steamy August day. Somewhere along the Ten Mile Ocean Drive in historic Newport, Jack had exchanged vows with Andi. He has a new family now. Clare had known this day was coming and had set the whole thing in motion by letting him go, but that didn’t make it any easier to imagine her Jack married to someone else. “Not my Jack anymore,” she said to herself. Taking another long look at the City by the Sea, Clare wondered what Jack was doing right at that moment. Was he kissing his bride? Making a toast? Dancing with one of their daughters? She shook her head, angry to have allowed herself even a brief trip down that road. What did it matter now? “Let’s go.” She wheeled herself to the door to let the nurse push her through the long hallways to physical therapy. After dinner, Clare worked her way into lightweight pajamas. She was proud of her ability to do things for herself, even small things like changing her clothes. Each little victory added up. Rolling the wheelchair across the room she’d called home for the last four months, she eased herself from her chair to the sofa on her own—another recent accomplishment. Her recovery was coming along slowly but surely. That she had recovered at all was a miracle, or so they all said. No one had expected her to ever emerge from the coma she’d been in for three years after being hit by a car. But four months ago, she’d defied the odds and awakened after a fever doctors had feared would finally end her life. Yep, a real miracle. Everything that happened since then had been somewhat less than miraculous: her twenty-year marriage had disintegrated, and her days were now marked by the struggle to regain her health. Clare knew she was lucky, but she’d grown tired of hearing that word. Doctors had told her she would most likely be confronted with physical challenges for the rest of her life, including chronic urinary tract infections, a propensity toward pneumonia, fatigue, muscle spasms, and other fallout from three years of inactivity. Oh yeah, what a miracle. A tearjerker movie on TV caught her attention, and it was a relief to be absorbed into someone else’s drama for a change. When someone knocked at her door, Clare muted the television. 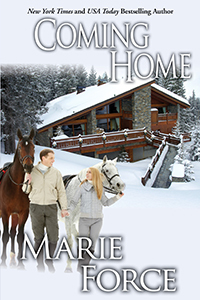 “Come in,” she called and was surprised to see Jack’s sister, Frannie Booth. Frannie crossed the room to sit next to Clare on the sofa. She wore her auburn hair in an elegant twist left over from her brother’s wedding. “How was it?” Clare tried to sound casual as she twirled a lock of her unruly blonde hair around a finger. “Oh.” Clare struggled to hide the surge of emotion. Jack had sons. “The girls must’ve been excited,” Clare said, referring to her daughters. Despite her best efforts, Clare’s eyes flooded with tears. “Johnny and Robby,” she whispered. “You wrote about them, too, didn’t you? About Jack and Andi?” Clare asked as she brushed a hand over the leather cover. Clare put her last bit of energy into that final step and then rested against his outstretched arms. Clare turned to find her doctor watching. “Great, an audience,” she grumbled and swiped at the sweat on her face. “I counted fifty-five,” Jeffrey said. “I don’t remember sending you an invite, Dr. Paul. What’re you doing here?” Clare thanked Jeffrey when he eased her into her wheelchair. He hooted. “Such flattery! It’s going straight to my head. I’ll take Miss Congeniality back to her room,” he told Jeffrey. “See you tomorrow, Clare,” Jeffrey said. “Have you talked to Dr. Baker about it?” he asked, referring to Clare’s psychiatrist. “Here and there, but we’ve been more focused on the attack and all that. I haven’t wanted to talk about the untimely demise of my marriage. I’m just a bundle of unresolved issues,” she said with the good-natured grin that had made her a favorite among the medical team that had cared for her over the last four months. “I’m sure they’re more than used to being without me. How do I get back three years with them?” She bit back the urge to weep. “Somehow I doubt that.” She twisted her hands in her lap. The idea of going home filled her with apprehension. NEWPORT—(August 27) It’s not every day that twins interrupt their parents’ wedding, but that’s what happened Tuesday. Jack Harrington, co-owner of the Newport architectural firm Harrington Booth Associates, and his wife Andi welcomed twin sons, John Joseph Harrington IV and Robert Franklin Harrington. The twins arrived in the midst of their parents’ wedding at the Infinity Newport Hotel where their mother is the general manager. The hotel, which opened in December, was designed and built by Harrington Booth Associates. “We thought we were just having a wedding, but I guess the babies didn’t want to miss it,” said Jamie Booth, Mr. Harrington’s business partner and brother-in-law. Mr. Booth is married to Mr. Harrington’s sister, Frannie. The Booths are also the parents of twins, one-year-old Owen and Olivia. “Andi and the babies are doing great,” Mr. Booth reported. The new twins are the grandsons of John and Madeline Harrington of Greenwich, Conn., Betty Franklin of Chicago, Ill., and the late Robert Franklin. They join sisters Jill, Kate, and Maggie, and a brother, Eric. Clare read it a second time. It was still so hard to believe that Jack was now married to someone else and had twin babies with her—twin sons, no less. And it was splashed all over the news. Anyone who didn’t already know she and Jack had recently gotten divorced did now. Knowing how much her daughters loved babies, she could imagine their delight with their new brothers. No doubt she would hear all about it when they came to visit. Thinking back to the girls being born brought a smile to Clare’s face. Jill had just turned nineteen and was beginning her sophomore year at Brown University in Providence. Kate would be eighteen in November, and they had agreed to let her go to Nashville for a year after her birthday to pursue a career in country music. And Clare’s “baby,” Maggie, would be thirteen in December. Clare reached over to the table next to the sofa to pick up the book Frannie had left. She had spent a few days working up the courage to look at it, and now the curiosity was overwhelming. Opening the book, she flipped to the first page, taking comfort in the familiarity of Frannie’s precise penmanship. The first item was dated June 20. It’s late and the girls are finally in bed. They were wound up today—the last day of school. We now have an 11th grader, a 10th grader, and a 4th grader. I’m thrilled to see them excited and happy for a change. It’s been a while. Jack sits by Clare’s bedside hour after hour, day after day. He talks to her until he’s hoarse and weak with fatigue. I look at him and wonder how he’ll ever live without her. But he’s not ready to think about that. I don’t know if he’ll ever be. Clare brushed a tear from her cheek and read several entries about the girls’ activities that summer. Jill had babysat for a neighborhood family, and Kate had gone to sleepaway camp for the first time. They went to the beach a lot, and Jamie took them out on the sailboat he owned with Jack. Jill is sweet sixteen today, and it’s her first birthday without her mom. She was weepy during the day but enjoyed the party we had for her after dinner. The nurses who care for Clare have become part of the family, and Jill invited them to have cake with us. Enough, Clare thought as she closed the book and wiped her tears. That’s enough for today. Jack brought Maggie in for a visit, and she burst into the room, chatting a mile a minute while her father hung back. Before Clare could answer, Maggie picked up the stream of chatter again in an obvious attempt to offset the awkwardness between her parents. She had gotten tall over the summer, and her sleek dark hair—so much like her father’s—hung down her back. “You’re not going to believe who showed her face at the beach today.” Maggie rolled her blue eyes as her parents looked on in amusement. “Hailey Harper. Ugh, we’re all so over her. After what she pulled in school last year…” Maggie shook her head with disgust. “Maggie, be nice,” Jack said. “Whatever. She’s the one with the problem. Hey, can I get ice cream?” Her eyes lit up, and Hailey was forgotten. “Rocky road?” Maggie asked Clare. “Hell of a honeymoon, huh?” Clare joked. “I am.” She brushed some imaginary lint off her jeans as she stole a glimpse of him. God, he’s gorgeous. He always had been, from the day they met on Block Island twenty-two summers ago. “This is so weird,” she said softly, giving voice to the tension between them. They’d been divorced for only two weeks, and he was already remarried with new twin babies. It boggled the mind. “Always.” He reached over to squeeze her hand. Maggie came in juggling two dripping cones. “Hurry, Mom, it’s running.” She thrust the cone at Clare and handed Jack his change. Her face lit up. “Oh, God, Mom, they’re unbelievable. They have shiny black hair and these tiny scrunched-up faces…” She trailed off and went back to her cone. “I know.” Clare had heard all about Maggie’s close bond with Eric, Andi’s son from her first marriage. Maggie had learned sign language to communicate with the hearing-impaired boy and was now almost fluent. Clare nodded. “I’m hoping you’ll want to spend some time with me.” I sound so pathetic. How will I ever compete with three new brothers? “I’ll come to your house to catch up on my sleep,” Maggie teased. “Yeah, some gray place, gray house or something,” Maggie said with a shrug. 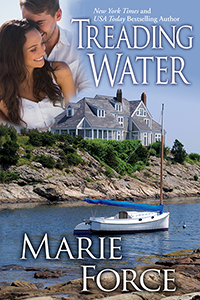 “Yes, I do,” Clare said, smiling at Jack’s need to live on the water. The door opened, and Kate came in. Clare was always amazed at how much her middle daughter resembled her, with the same unruly blonde hair and bright blue eyes. It was like seeing herself at eighteen except Kate had Jack’s height, which gave her a coltish stride as she crossed the room to plant a kiss on her mother’s forehead. “Don’t call her that, Kate,” Clare admonished, sending an empathetic smile to Maggie. “Ha-ha,” Maggie said, using a wet paper towel to wipe the ice cream off her face. “I see some things never change,” Clare said, delighted by her girls. “Mom’s coming home the week after next,” Maggie told her sister. Clare nodded. “Me, too.” She didn’t like to think about Kate’s impending departure for Nashville. Jack had made that decision before her recovery, and he had convinced Clare to give it a try for a year. He had promised her he would see to all the details, including making sure Kate had a safe place to live. Clare was glad she had a couple of months yet before she had to deal with that. “Sorry, Mom, but we’ve got to go,” Kate said with a kiss to her mother’s cheek. “I’m working tomorrow, so I need to hit the sack.” She had been playing the guitar and singing at the Infinity Newport Hotel’s outdoor bars all summer. “I’ll call you tomorrow,” Maggie promised, kissing her mother good night. “I’ll look forward to it.” Clare waved as the door closed behind them. Watching them go, she was hit by a sense of panic, wondering if they felt closer now to their stepmother than they did to her, wondering if she’d ever get back the close bond she’d shared with each of her daughters.